Via an Akamai report (registration is required to get the report), Latvia has moved up to fifth place in the average bandwidth rankings worldwide. The U.S. is down at number 22, with a net negative drop of about 1% in bandwidth over the last quarter and 2.5% drop in bandwidth over the past year. According to Akamai, the average broadband connection in the U.S. is about 3.8 megabits/second, which would reflect the fact that the cable companies dominate the broadband marketplace in the U.S. It is worth noting that the FCC just set a new standard for the definition of "broadband," which is 4 megabits down and 1 megabit up. This reflects the continuing focus on broadband as an "entertainment" service (that's what some cable companies call it) rather than a business service. With more people and businesses trying to work out of the home, symmetric bandwidth has become essential to economic development. The continuing acceptance of a bigger pipe into homes and businesses and a much smaller pipe upstream reflects a lack of understanding about business and job needs for broadband services, which need the symmetric bandwidth. India has announced a $35 computer for students. The Linux-based machine is intended to give Indian students at all levels, starting in grade school, access to an affordable computer. I proposed a $100 computer twelve years ago--at that time, no one took it seriously, but I'm glad India thinks it's a good idea. Fiber everywhere is the simple goal the national government of New Zealand has set. In ten years, the government intends to have a minimum of 100 megabit fiber connections to 75% of homes and businesses in the entire country. They are doing this by going open access. It's a very simple model. The government will help underwrite the cost of privately owned fiber, but only if the network owner/operator agrees to provide unrestricted dark fiber and/or Layer 2 transport to any service provider. It's a time--tested model already being used in places in the U.S. like Utah and the City of Palm Coast, Florida. The Australian, a major paper in Australia, has sold out the ad space on its iPad version of the newspaper. At least one paper intends to stay ahead of the news game and make the new medium work for its business. Good for them. Design Nine has been an advocate for open access for many years--long before it became fashionable. So it is nice to see that some places are finally figuring out that open access is the right way to do telecom. Via Ars Technica, the Australian government has announced a $38 billion (in U.S. dollars) plan to take fiber to most Australian homes and businesses. The government intends to operate it as a open access network, with private sector providers offering all the services. The article notes that the country has decided it will not impede economic development by allowing a single incumbent to make long term decision about how much broadband is enough. U.S. Broadband: Almost as good as Latvia! There's a slogan for you: U.S. Broadband--We're almost as good as Latvia! Kind of rolls right off the tongue. 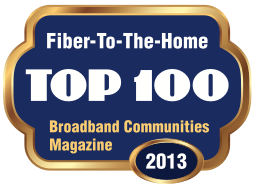 Here is a link to a list of the "top 10" broadband countries, and the U.S. is nowhere to be found. Grim news indeed for the country. The Intelligent Community Forum announced their Smart Seven communities for 2010 yesterday. One of Design Nine's projects, nDanville, was one of the ICF's Smart 21 communities this year, and got a mention for its success in attracting new jobs by building community fiber. How about 100 meg symmetric connections for $13/month? Hong Kong Broadband Network Ltd. is offering 100 megabit symmetric connections to its customers for $13/month. Costs are going to be lower for them because most of the customer base is living in high rise apartment buildings, which are less expensive to cable. I don't know about Hong Kong, but in Japan, the building codes require telecom duct to every apartment from the ground floor, meaning it takes under an hour to run fiber to a new customer in a Tokyo apartment. Meanwhile, in the United States, many of us are still getting our broadband via copper cable technology invented in the late 1800s. Spain says broadband is a "right"
Spain has decided that broadband is a "right," and is going to beginning legislating price and speed for bandwidth services. In the short term, this may get more affordable broadband to some rural areas of Spain, but in the long term, this kind of legislation tends to discourage innovation and competition. In the U.S., it is tempting to look at rural areas the lack of broadband alternatives and think that legislation is needed, but there are options, like having local and regional governments make investments in broadband infrastructure and make it available to the private sector, which creates true competition. And this is already working and creating jobs in places like Danville, Virginia and Galax, Virginia. In both communities, open access fiber networks are creating private sector jobs and attracting new businesses to the downtown areas where fiber is available. The BBC has an article asking what happened to public WiFi. The big WiFi projects that attracted so much attention in the U.S. five and six years ago (e.g. Philadelphia, San Francisco) failed miserably and were shut down or dramatically restructured. Some smaller municipal WiFi projects, like the one in St. Cloud, Florida, had some early rough spots but are still active. But local governments, by and large, found that free WiFi was expensive to support and often very lightly used. The BBC wonders if the new smartphones (e.g. the iPhone, Google's Android) will create a new surge of communitywide wireless demand. The answer is, "Probably." But looking five to seven years down the road, wireless Internet access will probably have shifted by then to WiMax or the recently opened 700 Mhz spectrum. And if I had to bet, the 700 Mhz could be the winner because it has sufficient bandwidth, the signal travels farther (fewer access points and less cost), and it penetrates trees and buildings better. WiMax, for all the hype, still has many of the shortcomings of WiFi because it operates in the same general frequency ranges. While rural areas will rely heavily on wireless for primary Internet access until fiber reaches most rural homes, fiber will replace wireless over the long term for fixed point access. But we all want mobile access, and so wireless services are here to stay. But it is an expensive technology, and communities would be served best by investing in open access basic wireless infrastructure (tower sites, towers, rooftop access on public buildings and water towers) and simply leasing out that basic infrastructure to private sector wireless firms. On the fiber sides, communities should build open access fiber networks and lease out the capacity to the private sector--for both wireless and fiber, these are public/private partnership solutions that keep government out of the business of selling telecom services but ensure that communities have some control over their economic future. A submarine cable serving several African countries has been damaged. The cable is the only Internet route out of several west African nations, putting the entire country into a virtual Internet blackout, with slow, expensive satellite links the only way for data to move in and out of the countries. Here in the U.S., some counties and states are bigger than these countries, and route diversity is now a serious issue for relocating businesses. Here is a nice little table that compares the price of broadband in various places around the world. Stockholm's municipal fiber network has the best pricing: $11 per month for 100/100 megabits (symmetric). Compare that to some U.S. offerings like one incumbent's 50/20 megabit (asymmetric, less than half the capacity) service for $145. Danny Choo guestblogs at BoingBoing about getting a SECOND 100 megabit fiber connection at his home in Japan. Why get a second connection? He's using it run a server, and the cost is only $11/month for the first year of service. The second year, the price goes up to a whopping $52 per month. One interesting tidbit if you read through the photo gallery--Japanese building codes require telecom conduit to be installed in homes and apartments during construction, so that fiber cables can be pulled quickly and easily into the premise. How many localities or states in the U.S. require this "Internet ready" approach (which adds only a few hundred dollars to the cost of a new home)? Ireland plans to spend hundreds of millions on 100% broadband access for the country. An extensive wireless network will be deployed to reach rural towns and homes that currently lack any broadband options. Wales has apparently been following what Nigeria has been doing with broadband--using post offices as anchor tenants to bring "big broadband" connections into small towns. The provincial government of Ontario is spending millions to help rural communities get high speed broadband. They have a nice slogan: "Turning miles into milliseconds." And that is really what it is about; rural communities have traditionally been isolated because of distance--many miles to major population centers and jobs. Broadband is the 21st century equivalent of the interstate highway, getting people closer to jobs, businesses, and economic development opportunities. The provincial government is providing a one-third match for the telecom investments, which is a big incentive for communities to get organized, raise awareness, and get started. This article warns that usable bandwidth in the UK will actually decline in the next several years without a major push to get homes and businesses connected with fiber. As more and more business and residential activities rely on broadband delivery (e.g. telepresence, gaming, movie and TV downloads), current copper-based and wireless systems will not be able to meet demand. A firm in Japan is rolling out gigabit broadband services to residential customers for $60/month. Back in April, FCC Commissioner Deborah Tate gave a talk and noted that the 100 megabit fiber connections in Japan were already showing signs of "congestion." The GigE service ought to improve throughput. Meanwhile, we still have lots of people in the U.S. talking about DSL (at around 1 megabit) as "broadband." U.S. Broadband: Almost as good as Nigeria? Nigeria is using a high performance network for the national post office (1,500 locations) to jumpstart community broadband connectivity. A new national backbone will be built, using the post office needs as an anchor tenant. But the high performance network will be designed to support other community broadband and service needs. This could work well in the U.S. at the regional and state level, and in fact, states like New Mexico are already studying just that--using state library, telemedicine, and research network needs to serve as the backbone for an open network available to businesses, residents, and service providers (Disclaimer: Design Nine was hired by the State of New Mexico to do that study). Private, single use networks are expensive and often limit economic development potential, because a dedicated K12, health, or state agency network usually can't be shared with the private sector. By building a single high performance network like the one planned for Nigeria, several anchor tenants can help offset the cost and not only lower the cost of telecom for their own organization but for the whole community as well. Some places in the U.S. are planning these networks, including the Eastern Shore of Virginia Broadband Authority. U.S. broadband: Almost as good as Malaysia? Once again, fairly small countries are far ahead of the U.S. in thinking about broadband. Malaysia has announced an ambitious but entirely doable plan to take fiber to major areas of the country, with the Federal government paying about 30% of the cost in a deal with the biggest telecom company in Malaysia. In the U.S., it would be the equivalent of the states making deals to write checks directly to the incumbent providers (which some states already do). The fiber system will have 100 megabit capacity, with a starter package of Internet access at 10 megabits. The good news is that U.S. communities and regions still have the opportunity to surpass Malaysia. Malaysia's deal with the incumbent telecom will not increase competition and will not be likely to encourage the rollout of innovative new services. Open service networks like those in Europe are beginning to gather momentum here in the U.S., and open networks tend to lower prices and bring lots of new services to businesses and residents. Five or six years from now, Malaysian cities will be behind many broadband community efforts in the United States.